Dionisia Pacquiao, The Reason Why Mayweather Won't Fight Manny? Home / boxing / Entertainment / news / Dionisia Pacquiao, The Reason Why Mayweather Won't Fight Manny? Dionisia Pacquiao, the celebrated mother of Filipino boxing icon Manny Pacquiao, could be the reason why Floyd Mayweather, Jr. won't fight Pacman. Mommy D has been stealing the spotlight from the fighting congressman during his weigh-in and actual fight against Chris Algieri in Macau, China, in which he won via unanimous decision, over the weekend. She was giving the crowd some flying kisses, waved her rosary and blessed the boxing ring as well as the entire Cotai Arena, and after the fight moved here and there, sometimes covering the cameras that were supposed to be focused on her son as the star of the show. Not all people were happy about it. In fact, veteran boxing analyst Ronnie Nathanielsz criticised the Pacquiao matriarch during an interview on ANC's morning talk show Headstart saying she should have stayed out of the picture. 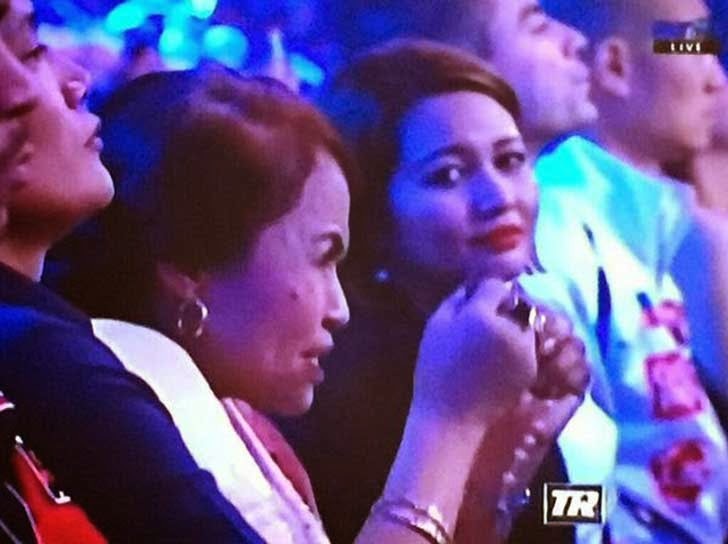 There were times during the fight that Mommy D, who was sitting beside her 38-year-old boyfriend Michael Yamson, was caught on video doing some hand gestures as if she was hexing to wish bad luck on Manny's opponent, but laughed by the time she knew the cameras where panned on her. Netizens on social media urged the Pambansang Kamao's mother to behave and show esteem. Despite all these, many people believe that Manny can easily win the fight against Floyd Jr. if she will be around during their bout (in case Mayweather finally decides to face the Pacman). It has been said that the undefeated American boxer is bothered by Mommy D's antics. Dionisia Pacquiao can provide some distraction while Manny finds a way to knock Floyd down.